UFC lightweight champion, Khabib Nurmagomedov didn’t attend today’s (Jan. 29, 2019) hearing with Nevada State Athletic Commission (NSAC) after agreeing to settlements for his involvement in the UFC 229 post-fight brawl. In today’s meeting, a five-member committee voted in favor of a settlement agreement, as a result, Khabib handed down with nine months retroactive disciplinary suspension when he jumped over the cage after defeating Mcgregor last October and coughing up $500,000 fine. Commission currently withholds Nurmagomedov’s $1 million fight purse. They will take the fine from that payday. Nevada State Athletic Commission has suspended Khabib Nurmagomedov nine months and fined him $500k for his role in the post-fight brawl at UFC 229 in October. Suspension can be reduced to six months if Nurmagomedov participates in an anti-bullying campaign. Khabib’s teammates Abubakar Nurmagomedov and Zubaira Tukhugov, who also took part in the melee were fined $25,000 and suspended for one year. Mcgregor meanwhile, slips through with six months of suspension and fined $50,000. The suspension is retroactive to Oct. 6, 2018, that means he’s eligible to compete again by Apr. 6. Conor McGregor suspended six months, fined $50,000. Eligible to return as early as April 6. 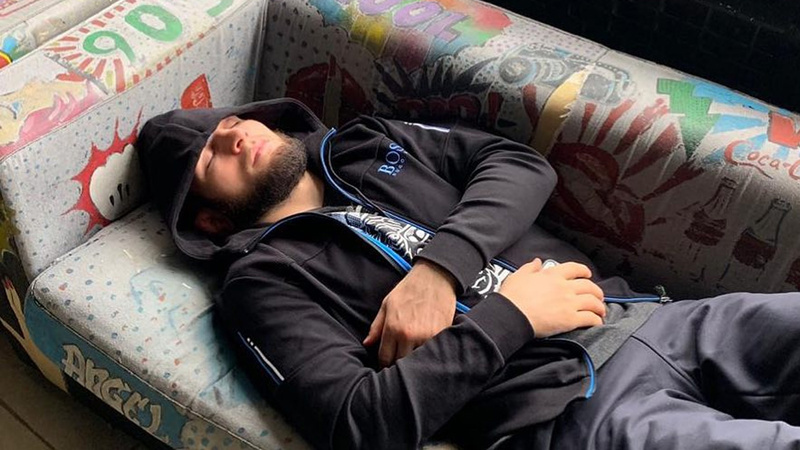 Shortly after the suspension was announced, Khabib took to social media to offer the best reaction and then took a nap.